US, 1972, 99 minutes, Colour. 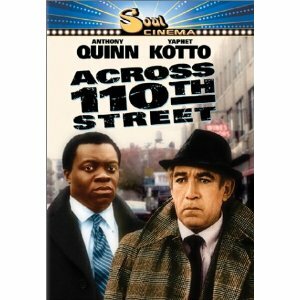 Anthony Quinn, Yaphet Kotto, Anthony Franciosa. The 70's saw a glut of police and mob dramas. Quantity again does not provide great quality. This is a well enough made story of robbery and investigation which indulges in gore seemingly for its own sake. What makes the film different is the clash between the younger detective in charge and the older officer with his beat-em-up attitudes of bygone days. This is complicated by the younger man's being black and the older man white. The clashes are presented vividly but do not rise above the level of the ordinary. 1. How successful a crime drama was this? What basic ingredients of crime drama did it use? The crimes themselves, robberies, criminal types, the police personalities, the Mafia bosses, negroes, Harlem atmosphere? How well did the film use its violence or did it overdo it? Where? Why? 2. How interesting a picture of police work in New York? Did it utilize well the New York backgrounds and atmosphere? How? Did the film have a strong sense of justice? As regards police and their work? As regards the big bosses and racketeers? As regards criminals? 3. How graphic a picture of Mafia influence did the film give? The initial sharing of money and the murders? Nick De Salvo and his trying to redeem Mafia losses? The Upper society of Mafia bosses? The nature of their evil? 4. How much did the plot depend on accidental circumstances? The fear in the initial robbery and slaughter? The behaviour of the various characters, their nervousness encounters etc.? How avoidable was the whole situation, the deaths, the massacres? 5. How important a character was Nick De Salvo? The fact that he was considered weak? A bully? His world? How brutal was he and why? Was he in any way sympathetic? 6. How interesting a character was Mettelli? An Anthony Quinn personality? The old style of policeman? How was his sense of values strong? How weak? Were you surprised he was on the take and yet had a strong sense of police work? The fact that he was about to retire? His inability to step down? His clash with blacks? The irony of his death? Was this too contrived? 7. The importance of the younger policeman taking over from the old? The integrity of the younger policeman, would he then become like Mettelli? What values did Pope stand for? How important was it that he was black? How did the film show the clash between Mettelli and Pope? 8. How did the film show well the nature of police investigations and searches? The use of informers? Mettelli and his contacts? Mafia information and blacks in Harlem? 9. Was the use of Harlem detail important for the film? The atmosphere it created: the parties, the use of the wealth, the two robbers and their ways of life? The laundry, the girl friends etc.? The possibility of slaughters? 10. How important was the atmosphere of fear in the film? U.S. violence and an atmosphere of open fear? 11. Comment on the presentation in the film of the clashes: between older and younger policemen, between black and white, between those who had been corrupted and those who had not. 12. Comment on the dramatic impact of the final shoot out? Was it necessary for the film? The nature of the violence and its visualisation? Its effect on the audience? 13. What is the purpose of this kind of film? Insight into life in America in the '70's? As a social document for later generations?